Save Marinwood-Lucas Valley - our community, our future: Who is the REAL race provocateur? The more I think about it, the more it appears this march was an attempt to deliberately provoke a response at a community celebration of our Little League kids. Noah Griffin is very media savvy, having served Nancy Pelosi and other politicians. He knows the power of visual imagery. The desired effect didn’t happen though when people ignored them except for a few passing motorists. The news media must have been disappointed. There are no gangs of racists defending the Dixie name. 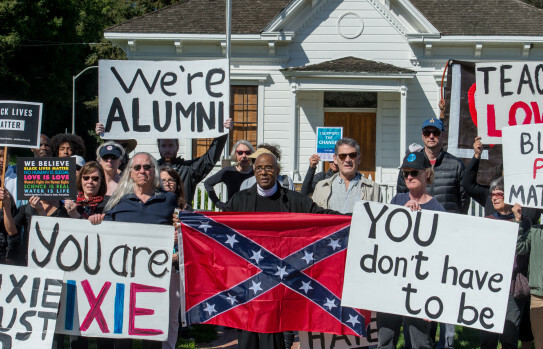 The ONLY time I have seen a confederate flag in Marin is when Noah Griffin held one up for this photo for the Marin IJ and other news media. Who is the REAL race provocateur? Have the Change the Name folks considered how trashing our neighborhood in the eyes of the world, actually CREATES the hostile environment that they claim to be against? I want to change the name of the district too but we must not allow the hateful rhetoric destroy our community. Why is Noah Griffin wearing a white turtleneck that looks like a cleric's collar? I don't think he is a member of the clergy. Pure showmanship.